Cream softened butter with sugar. Alternately combine butter- sugar mixture with dry ingredients and beaten eggs. I was able to use my electric hand mixer for combining all the ingredients by leaving out a cup of the flour mixture till the last. Form into 3 flattened balls and refrigerate dough at least 2 hours. It will keep at least a month in the deep freeze in a ziplock-type baggie. If you do freeze some of the dough let it defrost thoroughly in the refrigerator for ease of rolling out. To make cookies roll out dough on floured surface as thin as possible till almost transparent. Cut shapes with cookie cutter. 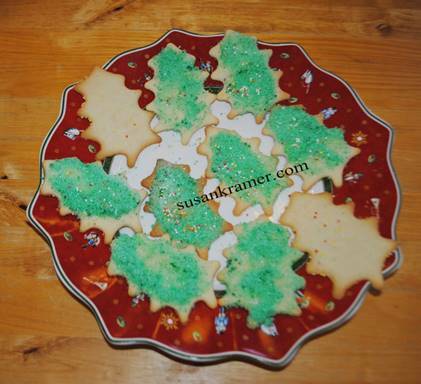 Lay on greased cookie sheets and decorate as desired. I like the colored ball sprinkles for Christmas cookies. Bake at 375 F. for 5 minutes or till desired stage of brownness. Remove from cookie sheets with a spatula and lay out on paper towels till completely cool. Store in tin cans lined with baking paper. 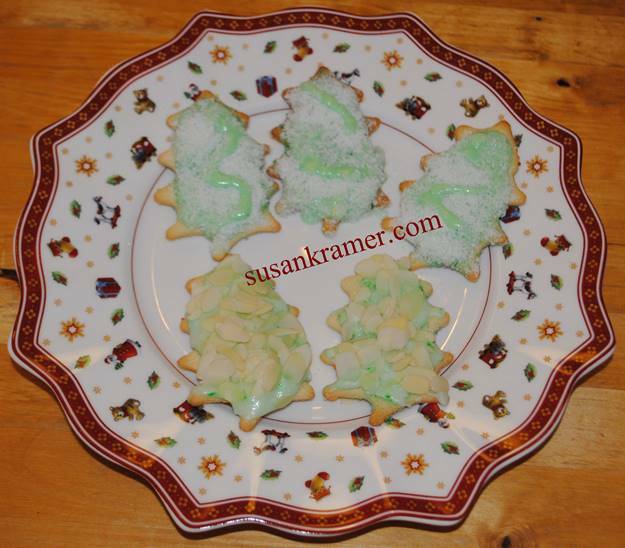 For the cookies in the second photo I spread on thick butter cream icing with almond flavoring, and topped with flaked coconut on the top 3 and slivered almonds on the bottom 2 cookies. All the best of cupcakes without all the calories.